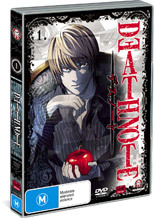 Death Note Volume 1 of 9 is an extremely cool anime series which revolves around Light Yagami, a brilliant student who discovers the notebook of Shinigami, the rogue god of death. With this notebook comes absolute power which Yagami uses to dispose of the criminals in the world as the ancient myths states that whoever's name is written in the book... dies! As dozens of criminals are found dead, a mysterious detective known as L is hired to investigate this mass murder who challenges Yagami and threatens his most noble cause. In this game of psychological cat and mouse, Yagami is tempted by the rogue god of the dead as one watches with awe, shock and horror of one brilliant child's attempt at being god. Quite a dark anime series, the unfortunately aspect of Death Volume 1 is that there are 8 more volumes in this awesome series. Brilliant from start to finish! Brilliant but bored high school student Light Yagami suddenly finds himself holding the power of life and death in his hands-the power of the Death Note. He decides to rid the world of evil-by killing off criminals one by one. When the murders start to pile up, genius detective L is on the case, and an epic battle of wits unfolds. While the world's criminals continue to drop dead, L meets by computer with representatives from various nations. He requests that a task force be set up in Japan, under the direction of none other than Soichiro Yagami, Light's father. Light-now known to the world as Kira-tests the Death Note to understand the scope of its powers by killing off six convicts in various ways-and confirms he can control his victims' actions before they die.